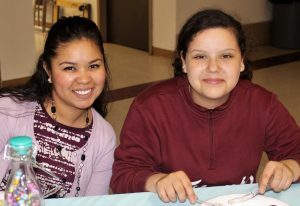 As we begin our sixth year of Impact Mentoring I would love to share the story of Gabby and Regina, a mentoring pair who have been together all five years of the program. Gabby was one of the first people I went to for advice when I was dreaming up the mentoring program. Gabby grew up at Impact and throughout her adolescence was mentored by several different people at Impact. She still keeps in touch with most of them and speaks about how much they impacted her as she was growing up. So when I approached her about the idea of starting Impact Mentoring, she was immediately on board and grateful for the opportunity to give another child what she was given growing up. Regina has been part of Impact her whole life. I first remember her when she was in red group (kindergarten) at VBS – I usually knew best the kids that spent a lot of time out in the hall, if you know what I mean. Gabby had directed VBS that summer and gotten to know Regina, so when she decided to mentor, she asked specifically for Regina. Regina is now twelve and no longer known for how often she is sent to the hall. Each year of their mentoring relationship has looked a little different based on schedules, but as Regina get older, they have been able to do more things together. This past year, Gabby would pick Regina up from Impact and take her to her house to cook dinner. They also share a love for reading. Gabby is a Vice Principal at an elementary school and has previously been a reading teacher. Throughout their time together, she has given Regina several books and Regina (without always admitting it) has grown a deep love for reading. Their relationship is exactly what I was hoping and praying for when we started the mentoring program. It is truly amazing to see the fruit of these relationships and I can’t wait to see how they evolve through the next five years. And if you live in the Houston area, we still need more mentors! Contact *protected email* for more information.